Most Zimbabweans seem to have an inate artistic flair. It is always inspiring travelling there and being surrounded by so much creativity. Sadly, these days, due to the desperate situation in their county, over 3 million have fled to South Africa looking for opportunities to feed their families. Even as far South as Port Elizabeth, many street corners show displays of their work, wonderful wood carvings, metal work, woven grass furniture , beaded wirework etc are all available at roadside stalls like this, on the corner of 8th Ave and Main Road in Walmer. These people are subject to much Xenophobia from local Xhosas, who say they are stealing jobs from them, but I support them whenever possible, because I admire their hard work, entrepreneurial spirit and artistic flair, and the courage they show, always cheerful despite the harrowing stories many of them can tell you. This pretty little mosque is one of the very old buildings in the inner City. These narrow streets run down from the main road (Govan Mbeki Ave) towards the sea, and Strand Street 2 blocks down, which in the old days was on the beach. Then land was reclained for the harbour and railways, and in the 70s a huge freeway built above strand street. Many of the original buildings from the 1820s and 1830s were replaced with ugly modern high rises, with interesting old treasures like this mosque sandwiched between them. The circular structures you see behind it are from a parking garage. In the late 70s this part of town was a thriving business hub, with all the big departments stores etc here. Then crime and urban decay took over, businesses moved to the suburbs, and many of the huge office blocks are now taken over by squatters who live in really gross conditions in buildings that were never intended for crowded human habitation. You really have to watch your back when you go there now. Even on a quiet Sunday afternoon when we went to take these pix, we had to be quite alert and keep the pepper spray handy. From the sublime to the ridiculous! We were on a 34 foot yacht, which is big enough to travel round the world in (admittedly you would need to have a screw loose in the brain to do it, but still!!) Two kids were having a ball scooting around in TINY little boats which were dwarfed by the big boys toys. That is until we all sailed past the container ship, and things were suddenly brought into perspective. The harbour here is too narrow to accomodate the new breed of container vessel which are 4 times the size of this one, so size really IS a relative thing! A perfect way to end a perfect day in the Bay! Yesterday we started on a sunset cruise at the Algoa Bay Yacht club.... meet our skipper, Doug, aboard Take 6. He is looking at the warning light beacon at the end of the harbour breakwater. 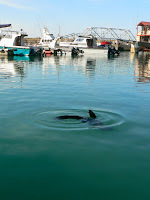 Recently one of our readers, Alan, kindly invited us to visit the Algoa Bay Yacht Club and take photos there. Well, we took him up on his offer yesterday, and had a wonderful time, snapping a ridiculous amount of photos (yachts and water are SO photogenic!) So over the coming weeks you will no doubt see many shots from that sunset cruise. To start us off, here is the yacht club seen behind some of its residents! One of the benefits of being known as the windy city (although, in fact statistically Cape Town and a couple of other places are windier than us) is that PE is a mecca for watersports of all kinds. 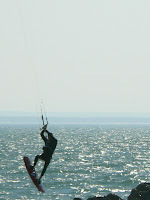 Kite surfing is hugely popular here, and when the wind is strong, the surfers get up to all sorts of antics, they literally fly over the sea. A PE scene which greets one on arrival into town from the main Settlers Freeway always arouses mixed feelings in me. On the left is a lovely sweeping view of the city and harbour across a sweep of the bay, and to the right is the North End Prison, overlooking a graveyard! This view has always struck me as particularly gloomy. I have been wanting to capture the mood of this for a while now, and Sunday presented the perfect opportunity, the roads were quiet, and it was a gloomy cloudy day. In the end, we actually went in and drove around inside the graveyard, and found some fascinating graves and odd discrepencies, so I'm sure there will be more on this 'grave' subject to follow, hope we don't freak you out! We even thought of doing a series on 'interesting headstones', because there is such a world of human history to be found in these places. The International Red Cross has an office in Port Elizabeth. As with many businesses around the inner city, the premises have their share of protection against crime. I thought they made quite a statement, as they appear next to this sculpture in their front courtyard, showing the work of the Red Cross in helping the sick and injured. Sort of a graphic depiction of good versus evil and all that! P.S. bc of chicago dp has given us a "you make my day" award... thanks bc, you made our day! Not being too into tagging, we'll simply pass on the happy vibes to all who visit here, and who we visit, you make our day too! Another view of the ruins of St Peters Church in South End. 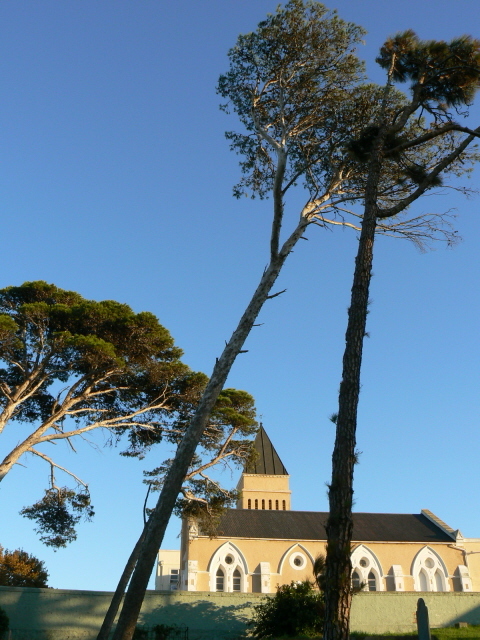 In order to stop the displaced members of the congregation returning to worship there, after the forced removal of the South End residents, the apartheid government demolished the church. Though there are a lot of townhouse developments around the St Peters, the remains of the church will be retained as a testimony to past injustices. Just the other day I mentioned the old Tramways Building, the historical landmark in the heart of the Port Elizabeth city centre, and lamented how run down it has become. Well it was announced on Wednesday that the Municipality has awarded Pambili Developments (Pty) Ltd the tender to redevelop the Tramways building. The development will contain a mix of tourism, leisure, entertainment and office space. The construction will begin in April 2008. The Tramways redevelopment project will be managed by Mandela Bay Development Agency which was also responsible for the major Urban Renewal project in Market Square and Govan Mbeki Avenue, which we featured recently. So it looks like things are really looking up in the Historic Areas of our city, yay, well done guys! Looking across Nelson Mandela Bay, which was previously Algoa Bay, but most in PE are proud of our new name and the associations with our much loved former State President. 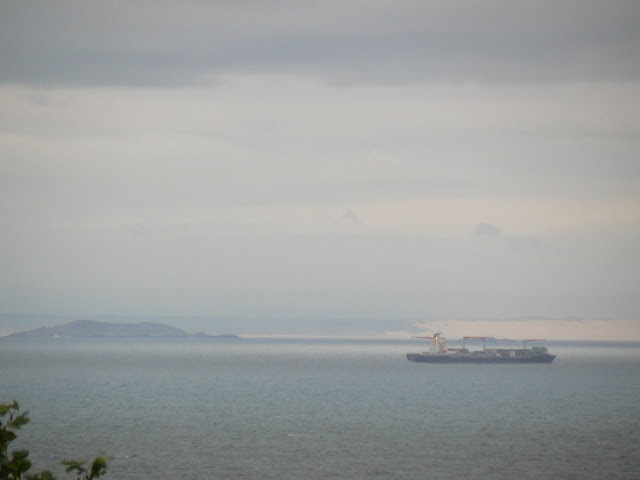 When large tankers arrive and want to come into harbour, they wait across the bay until it is their turn to come in. In the background is the island of St Croix, 17km away as the crow flies. It lies in the direction of the new deep water port at Coega. You can also see part of the extensive unspoilt dune fields between Coega and the Sundays River. Edit: Firefly pointed out in the comments that the bay is still called Algoa Bay, it is just the metropolitan area of Port Elizabeth, Uitenhage and Despatch that is collectively called Nelson Mandela Bay. Sorry for the misinformation, and thanks for setting the record straight, Firefly! In PEs early days, it was the major port for the export of hugely popular ostrich feathers. The ostrich industry was thriving, and a huge hall was built close to the harbour at which the feathers were auctioned. Over the years the industry declined, and the hall was used for concerts and other public gatherings. When we moved here in the late 70's we went to a Janis Ian concert there (remember Fly too High, and at 17? ), at that stage it was quite run down, and the accoustics were terrible, not to mention the pigeons who roosted in the roof and pooped on the audience! Then shortly after that it was renovated, with acoutstic tiles on the roof, and is now a very successful conference centre. 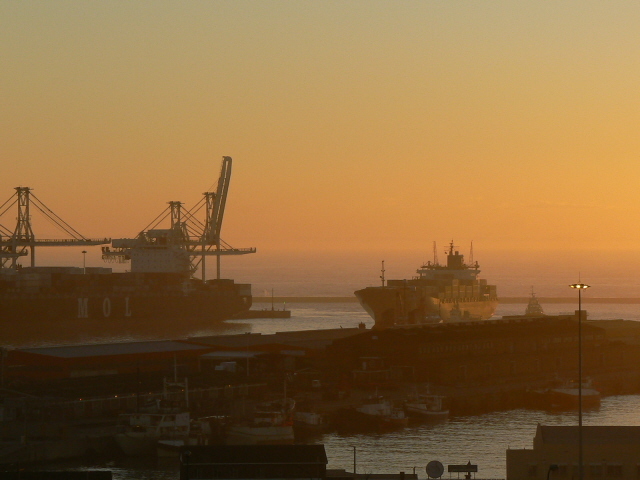 A ship is brought into the harbour at sunrise, to the right you can see one of the two tugs which shepherd it into its berth. To the right is a building which belongs to the Municipality. (No wonder they don't have a leg to stand on in dealing with slum lords when they let their own proprties get into such a state!) It was at one time a bus depot, an ice rink and a shelter for the homeless, now it is just a dump! See the tall building standing on its own at the top of the hill? To the left of that you will see a long low reddish stone wall. That is Fort Frederick with its commanding view across the bay. The Baakens River Mouth is where the 1820 Settlers landed to establish the as yet un-named town. This is an exhibit in the fascinating Red Location museum. It shows anti apartheid posters which were circulated when the restrictions were at their worst, anyone found with one of these would have been in for a very bad time! The books on the little tables are transcripts of the proceedings of the Truth and Reconciliation Commission, chaired by Archbishop Desmond Tutu, with the intention of bringing into the open the atrocities committed during the apartheid era. They make very chilling reading, but many families who lost loved ones in horrible circumstances were able to achieve some form of closure through this process. Hi there, would you like to travel with us? 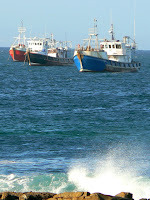 We are in Port St Francis for the weekend, and thought you might like to come along for the ride! It is home away from home for many Port Elizabethans who have properties here, as it is just an hour away on a good freeway, and has a delightful laid back holiday village atmosphere. 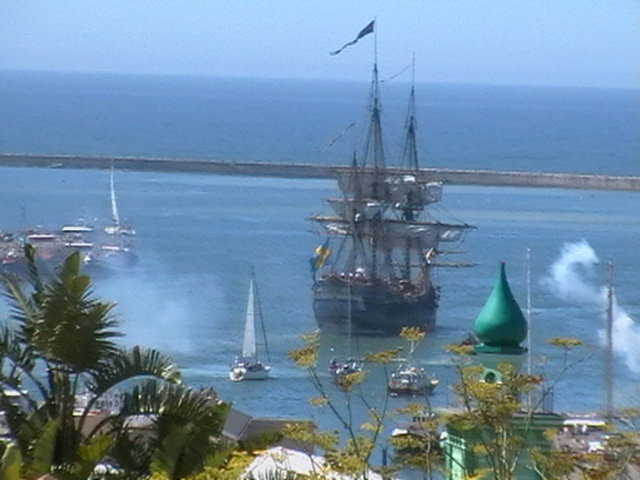 But for today, this is a view from our balcony, overlooking the yacht basin at the Port. This sports oval, now host to many school sports days and track and cycle events, started out as a muddy vlei (wetland) known in the late 1800s as "Russell Road Dam". It is right next to the lands which belonged to the London Missionary Society, where bubonic plague broke out in 1902. This picture was taken early one morning last week, when a small group of cyclists were practicing. Ever since being awarded the honour of hosting the 2010 Soccer World Cup, South Africa has been gripped by soccer fever. New stadia are being constructed around the country, many attracting a lot of controversy with strikes, deadlines not being met, and budgets which keep multiplying beyond original estimates at a terrifying rate. Last weekend we went to check out how things are going with the Port Elizabeth Stadium. mmmmmm, well, a way to go yet! Watch this space! 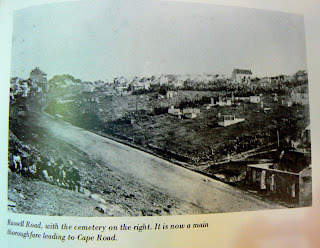 Another of the "Kloofs" in PE which carries a major arterial road used to be called Coopers Kloof, until Albany Road was built through it. Construction began in 1865. This building is Port Elizabeth's Old Fire Station, built in 1930, which has been replaced by a modern new facility in Summerstrand. It is now used as an office complex. Behind it, you can see the cliff face that formed part of the river valley. Above it is the Old Erica School which we showed you recently, and on the edge of the cliff to the right of the school and round tower is the viewpoint from which this photo of the bay was taken. 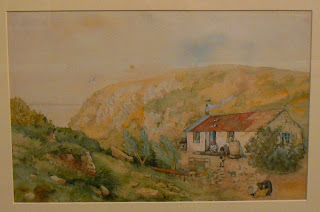 Sorry to ONCE AGAIN flout the rules and post more than one photo, but I thought this old watercolour, done in the ninteenth Century, would interest you, this is looking down Cooper's Kloof to the sea, so the firestation was built a bit further down towards the sea on the right, beyond this old cottage. 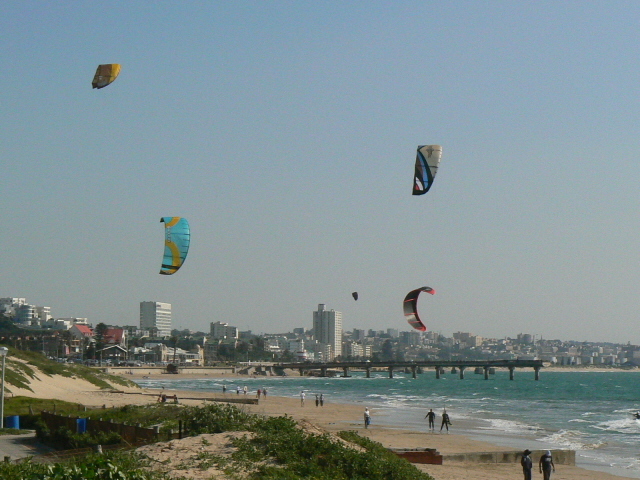 One of the main suburbs of Port Elizabeth is Walmer. In the early days, it was a seperate village with its own Town Hall, but it has long since been absorbed into the PE Metropole. Because much of the coastal part of the city is built on a series of sandstone hills, bisected by fairly steep river valleys (known locally as kloofs from the Afrikaans, and pronounced more or less clue-if, with the two syllables flowing together) the main arterial links between parts of the city had to be constructed in or across these valleys. Today, as promised last week, here is a glimpse of the Edwards Memorial Church, which overlooks the graveyard that started this whole saga. If you want to follow the Richmond Hill story chronologically, hop back to that post, and then read the post on the Synagogue, where the connection between the different elements of the next few posts is set out. Then skip out the New Years Eve and New Year posts, and begin again with the Red Location post, from there you can follow the story through. This Chapel started out being built by the Congregationalists, and used by the London Missionary Society, to serve their congregation of workers who lived around it, mostly from the Xhosa, Fingo (today called Mfengu) and Basuto tribes. The foundation stone was laid on Feb 13th, 1875. The first minister was Roger Edwards, who came out for the LMS in 1823, and after a lifetime's service around the country, (including accompanying David Livingstone on the beginning of his epic journeys through Africa) retired to Port Elizabeth. In 1921 the Dutch Reformed Church bought the building and in 1948 the tower was added and extensive renovations carried out. A new Edwards Memorial Church was built at New Brighton to serve the workers who were relocated there from 1903. So in 1820 several shiploads of settlers were appalled to arrive in the bay and see in front of them a row of "barren sandhills". Rows of tents and piles of supplies were set out amongst the coastal dunes, and from this they had to start to build their lives and the town. As it grew, labourers were brought in to help load and unload ships, among other things. They were mostly from the Mfengu tribe, who were related to the Xhosas. They lived on what is now Richmond Hill, in traditional straw beehive huts. Continuing the Richmond Hill story from yesterday (and if you are new to this thread, go back to the post called Places of Worship #6 for the background history), the area known as the Strangers Location and the lands owned by the London Missionary Society had an outbreak of Bubonic Plague in 1903, and were burned down. The residents were relocated to the Red Location in New Brighton, about 6km away as the crow flies, so naturally getting to work at the Port became much more difficult for them. (This was before Apartheid became official policy, but certainly it set the foundation for later forced removals in the 60s and 70s, which caused so much heartache and suffering, as well as loss of heritage sites.) 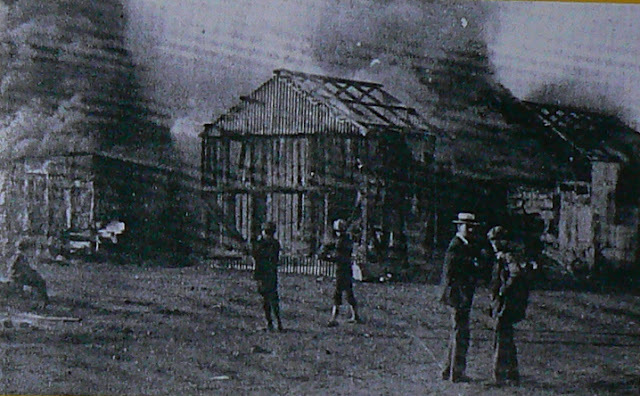 The photo shown here was taken in 1903 and shows the actual burning of the houses, while supervisors and spectators look on. It is a photo taken of the original which is on display in the Red Location museum. The other day we gave a brief description of the history of the Richmond Hill area. We mentioned that part of it was called the Strangers Location, and next to it was a section owned by the London Missionary Society, and used to help house workers, mostly employed at the Port. Here is an old wood and corrugated iron house from their section, much of which was destroyed in 1903.... but that is tomorrow's story! As promised in our post on Sunday, 30 December here is a picture of some of the original houses that were built in what became known as the Red Location. Believe it or not people still live in some of these houses. The Red Location was established around 1903, when the black residents of the Strangers Location and at Coopers Kloof (Albany Road) were moved from Port Elizabeth. The name of the Red Location comes from the corrugated iron barracks, brought down from a defunct concentration camp at Uitenhage and the Imperial Yeomanry Hospital at de Aar; that had been used in the South African War of 1899 - 1902. In time, these sheds eventually rusted and turned deep red - hence the name Red Location. Today the area is an eclectic mix of old and new, boasting the award winning Red Location Museum, which is surrounded by the original houses, new modern homes and a selection of wood and iron shacks. January Theme, best photo of the year. Because it is SOOOO hard trying to select our best photo for today's theme, we requested help over the last few days to decide on the best shot. Thanks to all those who checked them out and gave your opinions. Based on the results, the Rainy Day in Richmond Park is the one we are using. As we explained, because this is quite a new blog, we didn't want to redo any of the ones we have already posted just recently, so this is a new one. So here, by popular choice, is the best PE photo. 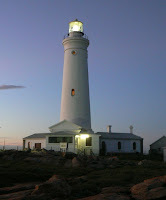 However, I have another favourite, not taken in PE, but near Caledon on the way back from Capetown at Easter. Since some of you have already seen the one above while voting, I am also including this previously unseen one. It was a misty morning and we left before sunrise. This is one of my favourites because it seems to say so much more than just "misty sunrise on the open road... it speaks of the joy of the journey, the open road spooling out ahead, the mystery of the landscape shrouded in mist, what does the journey hold for us? And the promise of a new dawn...... which seems very apt as we head into the misty sunrise of a New Year. What will it hold for us? Here's wishing you a great 2008! Of course all this presupposes that we are talking about our photos. There are so many brilliant shots that we have seen in blogland this year, and it would be impossible to select just one, but we'd also like to give you a link to one which was particularly striking. Mike from quick snap 365 took it. It is the bottom one of the two tower photos, taken last Autumn. 113 City Daily Photo Blogs from around the world are participating in this theme, why not give yourself a treat and visit the links to experience some brilliant photography?! !